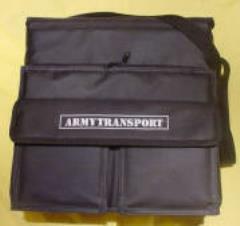 The ARMY TRANSPORT is the most versatile miniature carrying case and storage system! The ARMY TRANSPORT safely holds many miniatures in EIGHT easily customizable FIGURE FOAM TRAYS. Inside each ARMY TRANSPORT you get 6 x 1-inch thick foam trays and 2 x 2.5-inch foam trays. There is one large outside zippered book pocket and two additional accessory pockets.